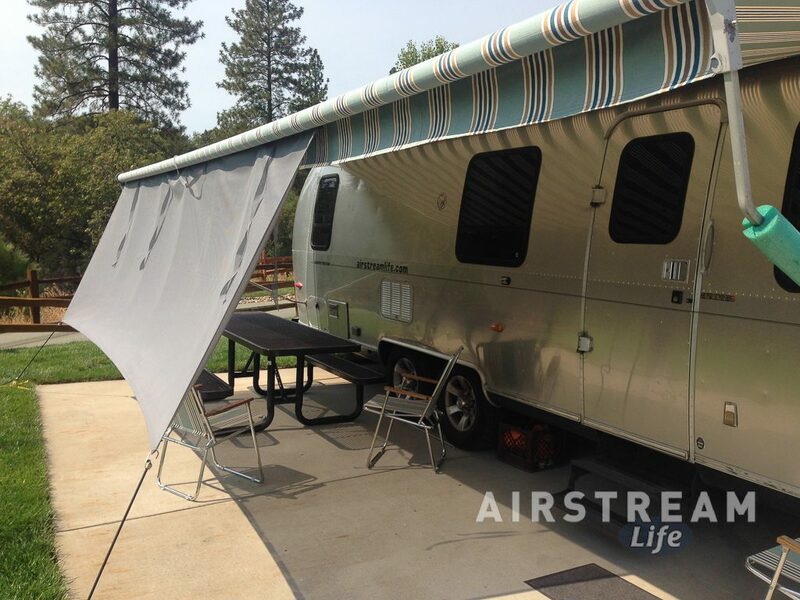 Is it safe to tie down your awning? You are here: Home / Cleaning and exterior / Is it safe to tie down your awning? This one is a bit controversial. 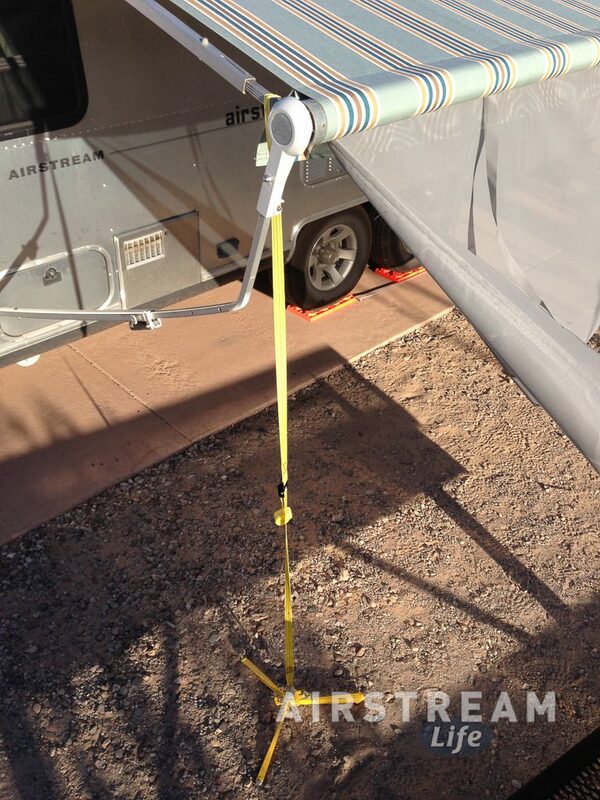 We sell a very nice tie-down kit in the Airstream Life Store that is really great for securing almost anything to the ground. Although it’s great for dog leashes, kites, solar shades, and even airplanes, a common use is to tie down the Zip Dee awning so it doesn’t flap as much on a breezy day. I like to do this when we are camped near a beach or any other place where it tends to be breezy. But fair warning: the moment you propose to tie down your awning, someone will come up to you and proclaim that you should never tie down the awning. 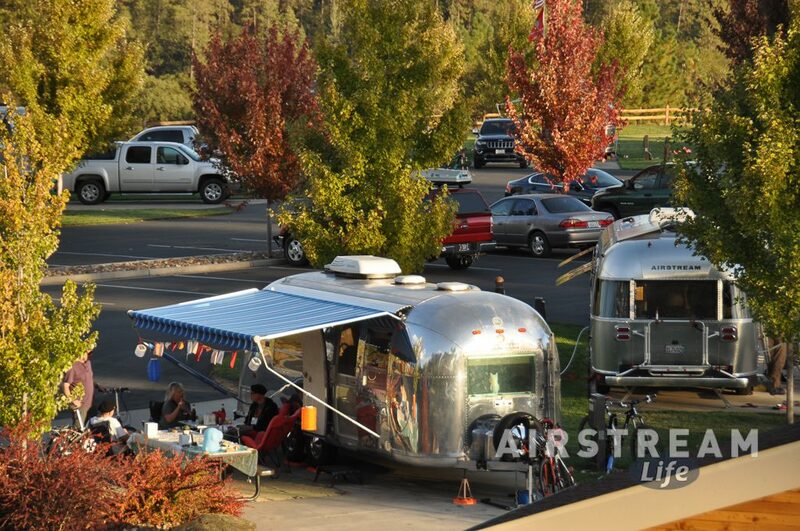 Even Zip Dee, the manufacturer of your Airstream’s awning, will tell you they don’t recommend it. So you might feel a bit foolish for having bought a tie-down that you are officially discouraged from using. Well, I’ll go out on a limb and say that’s overly-precautionary. Tying down an awning won’t hurt it. Leaving it deployed in a heavy wind or storm will. Zip Dee says your awning will be fine in a light breeze, but they don’t give an official wind speed limit. Instead, they say things like “if you’re comfortable in the breeze, the awning probably is too.” I’ve also heard various numbers tossed around but there seems to be no exact consensus. Somewhere above 20 MPH there’s a point at which a deployed awning arm might bend, but without a wind tunnel or a really good mechanical engineering study I doubt we’ll ever know exactly. So if there’s a chance of heavy weather (like thunderstorms or high wind gusts), take down your awning as a precaution. And always take it down at night, because if you don’t the wind will magically pick up around 2 a.m. and the rattling of the awning will wake you up. Take it from me. I’ve taken the awning in many times in the pitch black, wearing pajamas. Now let’s get real. On a day when there’s a lot of sun and a mild breeze, I’ll be a rebel and tie down the awning. (Yeah, I live on the edge.) I do it because the awning rattles and flaps in the wind and it’s distracting. As long as the wind stays moderate, tying down the awning won’t do any harm. The theory against using a tie-down seems to stem from the idea that a Zip Dee awning has some flex built into it, which helps it resist damage in the wind. If so, I’m taking some of that flex away by pulling the awning down with my tie-down. I can live with that, in exchange for a bit of quiet. Obviously, if the wind picks up, I’ll disconnect the tie-down and roll up the awning. We’re not talking about complex calculus here. But if you can’t stand the idea of helpful people coming up to you to explain that you’re not doing it correctly, then I recommend a Solar Shade. This snaps to the underside of the Zip Dee awning and adds some privacy and shade to your outdoor living space. Use “The Claw” to secure the Solar Shade instead. This has the same effect of quieting the awning in a breeze, with the security of knowing that the Solar Shade will disconnect at the snaps if the wind pressure becomes too high.